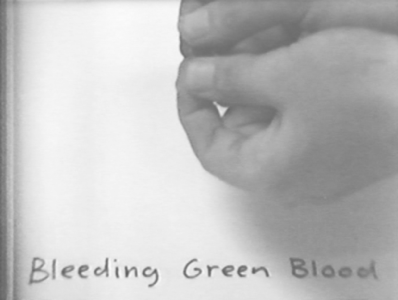 Matt Mullican, Untitled (Pricking my finger / Bleeding green blood), 1973–74. Still from video, 3.43 min, ed. 2/3. 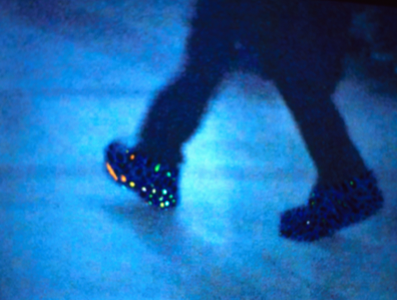 —posited the exhibition space as a crystalline test site of material experiments still in process. 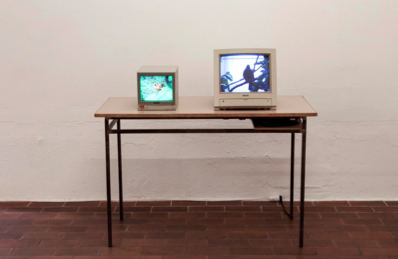 The two following exhibition modules, “And Bird” and “Frog And”, took their cue from a dual monitor work from 2000, Frog and Bird, in which a frog seemingly listens to a singing blackbird. s current interest in the implications of the you—the strengthened identification with a fictive character through a second-person point of view. Matt Mullican, Sleeping Child, 1973 / 2014, installation view at PRAXES. 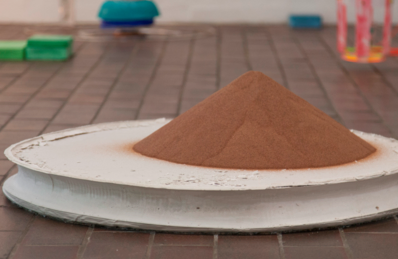 Christina Mackie, Sketch for Drop, 2014, installation view at PRAXES. 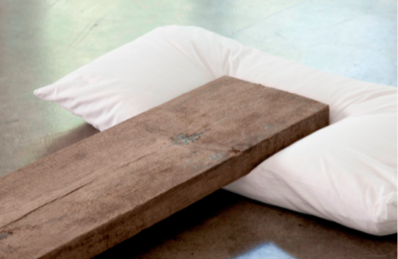 s Sleeping Child is the stick figure, alive and fully absorbed in slumbering, a third-person narrative of a wooden plank and a person resting as one. ” centered on Christina Mackie’s initial blueprints for a series of ten-meter, dye-drenched silk filters, exhibited at Chicago’s Renaissance Society in 2014. At PRAXES, the two white nylon maquettes were anchored by new samples of found and fabricated material indicating future processes of dipping, dyeing, coating, collecting, and molding. Christina Mackie, Frog and Bird, 2000.
assemble existing pieces spanning Mackie’s more than thirty years of production. Taking its cue from a dual monitor work from 2000, Frog and Bird, "And Bird" focused on notions of performative matter and fabricated or perceived interactions, among these the stripy sculpture Spirit of the Planet Saturn. Performance documentation, Matt Mullican: "Second Person" at PRAXES. 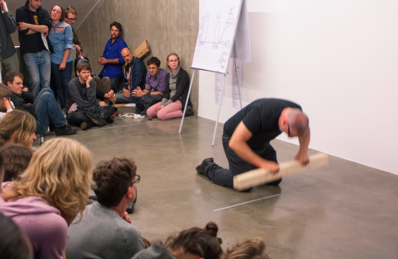 ’s practice in its entirety, revisiting the studio archive, inviting speakers with specialized knowledge, and providing a framework for a new performance, PRAXES offered itself to Mullican and audiences as a collective research facility. The one-off activities were accompanied by a series of accumulated displays of performances props, archival material, documentation, and artworks related to the unfolding investigation. More information about the events our Parlor page, here. Christina Mackie, Foo, 1994. Film still. Born in 1956 in England and raised in Canada before relocating to London in the 1970s, Christina Mackie has exhibited extensively with recent solo exhibitions including The Renaissance Society, Chicago (2014), Kunsthal Charlottenborg, Copenhagen (2012), and Chisenhale Gallery, London (2012). A monograph on her work, supported by the Contemporary Art Society, UK, will be released in 2015. Born in 1951 and trained in Los Angeles and New York City, where the artist still partly resides, Matt Mullican is based in and works from Berlin, teaching as professor of sculpture at the Art Academy in Hamburg (HfbK). Mullican recently had solo exhibitions at Museo Tamayo, Mexico City (2013), Haus der Kunst, Munich (2011), Jan van Eyck Academie, Maastricht (2010–2011), and Institut d’art contemporain, Villeurbanne (2010). His work was also included in “The Encyclopedic Palace” exhibition at La Biennale di Venezia (2013). Christina Mackie, Breughel Boots, 1999. Still from video, 3 min. concen-trated on the incidental encounter, the attuned observation, the faces in the forest. 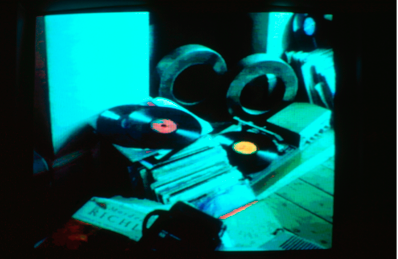 Dedicated to the early video work, Foo, this display became a universe of its own logic—one in which a homely interior contains both everyday belongings and a chang-ing landscape weathered by a foreign system, resonating and creating (compulsive) listening for any person (or frog) reached.